Exosomes purification and analyses comprise a fast evolving research area; more than 70% of published research on exosomes has been done within the last six years. Challenges to researchers working with exosomes include setting up density gradients by hand, because it is tedious, time-consuming and subject to user, lab, and method variability. There also is a need for greater accuracy in size and concentration analysis. At the same time, experts in the field have called for the establishment of standard protocols1. This paper focuses on solutions to those challenges through cost-effective, large-scale purification, and fast analysis of exosomes. 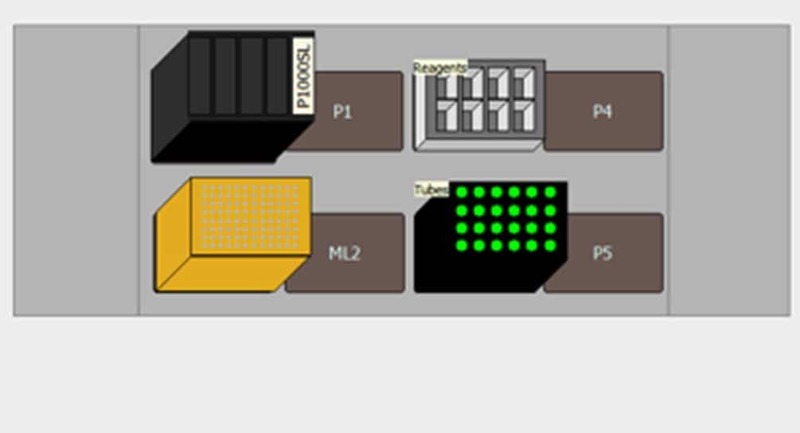 Specifically, the Biomek 4000 Workstation helps overcome human variables and provides a consistent, reproducible, high-throughput method for gradient setup, representing a breakthrough solution to scale-up problems.Optima Ultracentrifugation Series helps researchers maintain reliability between runs, making outcomes highly reproducible. The DelsaMax CORE saves time and cost of TEM analysis for size and concentration. Although scientists have known about extracellular vesicles for decades, only recently have techniques been able to distinguish exosomes from microvesicles and apoptotic bodies. Classification of membrane vesicles—and the most appropriate, and effective protocols for their isolation—continue to be intense areas of investigation. When isolating vesicles, it is crucial to use systems that are able to separate them, to avoid cross-contamination. At the same time, there is a need for increased size and concentration accuracy, as well as enhanced workflow. Exosomes are membrane vesicles (~ 30–120 nm in diameter) released by almost all cell types2,3. They are freely available in plasma as well as other body fluids and contain proteins, mRNA and miRNA , representing the cells they are secreted from4,5. Exosomes have come into focus as diagnostic as well as therapeutic biomarkers. Additionally, exosomes have been shown to be part of inter-cellular communication functions, with implications toward both anti-tumour and pro-tumour activity6. Previous work has provided insight to the isolation of exosomes using density gradient ultracentrifugation2,7, although there is an effort to gain more concrete confirmation of the size and concentration after purification. Here we present a simple workflow using automation, centrifugation and dynamic light scattering (DLS), to purify and analyse exosome samples. The Biomek 4000 Laboratory Automation Workstation helps overcome the human variable and provides a consistent, reproducible, high-throughput method for density gradient setup—an elegant solution to scale-up hurdles. Preparative ultracentrifugation helps to maintain reliability between runs and high reproducibility. Importantly, preparative ultracentrifugation reaches the g-force necessary for timely separation of biological macro-molecule samples to their isopycnic point in density gradients. The DelsaMax CORE DLS platform is used for size analysis of the fractions, because exosome particles can be: (1) analysed in solution, (2) with statistical significance, (3) with less cost and time, compared to Electron Microscopy. Instead of taking several hours to analyse a few hundred particles, the DelsaMax CORE is able to analyse and size thousands of exosomes in one minute. Figure 1. Deck layout of the Biomek 4000 Workstation Showing the Basic Tools Required for Gradient Prep. (1) One 24-position tube rack for placing nanotubes: the centrifuge tubes fit the existing 24-position tube rack, but new labware type had to be created to accommodate the height of the tubes; (2) one P1000 tip box for P1000 wide bore tips; (3) one Biomek 4000 Workstation P1000SL Single-Tip Pipette Tool for liquid transfer; (4) one Modular Reservoir for gradient reagents. The density gradient was made on a Biomek 4000 Workstation (Figures 1 and 2) by using a P-1000SL Single-Tip Pipette Tool and P1000 wide bore tips. The method has flexibility to change volumes for each gradient, as well as the number of tubes prepared. A 14mm, 24-position tube rack was used to hold thin-wall ultracentrifuge tubes (Beckman Coulter P/N 331372) which were programmed in as new labware. A slow pipetting technique with liquid level sensing was used to minimize inter face mixing of the gradients. The gradient was an overlaid gradient, as shown in Table 1. For exosome isolation from Jurkat cells, cells growing in log phase (final cell density ≈1 x 106 cells/mL, counted using Vi-Cell XR) for 24 hours were centrifuged at 750 x g for 15 minutes to sediment the cells, followed by a 15-minute run at 2,000 x g to sediment dead cells and larger debris, using the Allegra X-15R centrifuge with SX4750A rotor using sterile 50 mL conical tubes. Subsequently, the supernatant was centrifuged at 10,000 x g for 45 minutes at 4°C to remove cellular debris and filtered through a .22 μm membrane prior to exosome pelleting by ultracentrifugation. The exosomes were pelleted at 100,000 x g for 90 minutes using an SW 32 Ti rotor and Optima XPN Ultracentrifuge. The exosome pellet was washed and re-suspended in 1 mL of Phosphate Buffer Saline (PBS) and layered over the density gradient prepped using the Biomek 4000 platform. The density gradient fractionation run was per formed at 100,000 x g at 4°C for 18 hours using a SW 41 Ti rotor and Optima XPN Ultracentrifuge, with maximum acceleration and deceleration. The tube was aliquoted into 20 fractions—the top fractions were 1 mL each and the middle 14 were 600 μl each, while the last four fractions were 400 μl each. The resulting fractions were ultracentrifuged at 100,000 x g for 1 hour in an Optima MAX-XP Ultracentrifuge using a TLA120.2 rotor to pellet out the exosomes. The pellets were re-suspended in 1.2 mL PBS, and the pelleting step was repeated to get rid of excess OptiPrep™ (60% Iodixanol), which could interfere with the DelsaMax CORE analysis. The pellets were finally re-suspended in 100 μl of 1x PBS. The 20 fractions were frozen at -80°C for 48 hours, followed by thawing at room temperature. Size analysis was done using the DelsaMax CORE; briefly, 20 μl of each fraction was placed in DelsaMax CORE disposable cuvettes (minimum volume, 4 μl). Samples were run at 25°C. Three measurements were acquired per fraction, with each acquisition taking 20 seconds. PBS was set as the sample solvent. Following typical DLS procedures, an auto-correlation function was generated from the light scattered by each fraction. The auto-correlation function was analysed from 32 microseconds (μs) to 4 * 105 μs with regularisation analysis. Regularisation analysis will detect multiple peaks from 1–10,000 nm, helping to determine the purity level of each fraction. A user-defined parameter called “Fraction Number” and “Density” was created, allowing the software to plot size against fraction number and density. Results were plotted as a % mass distribution in order to accurately represent the size distribution of the biological sample. Figure 2. Exosome Gradient Method. New tube transfer technique was created to minimise the mixing during gradient prep. 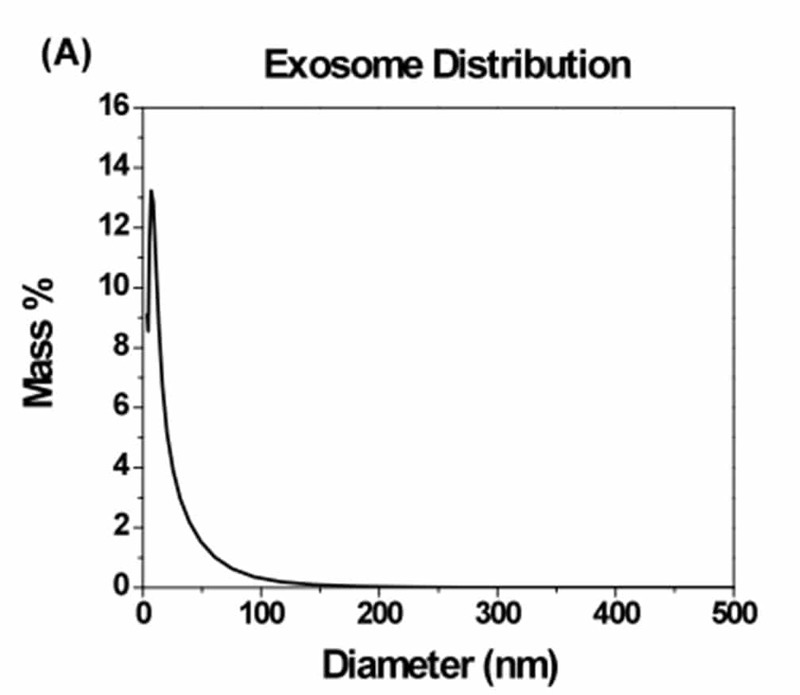 The size distribution results (Figure 3) of the exosome sample preparation indicate that density gradient is an important step in isolating exosomes. When ultracentrifugation and pelleting are used alone, without a density gradient, larger species and cellular debris are removed from the exosome sample. However, protein and small macromolecule impurities remain (Figure 3A). 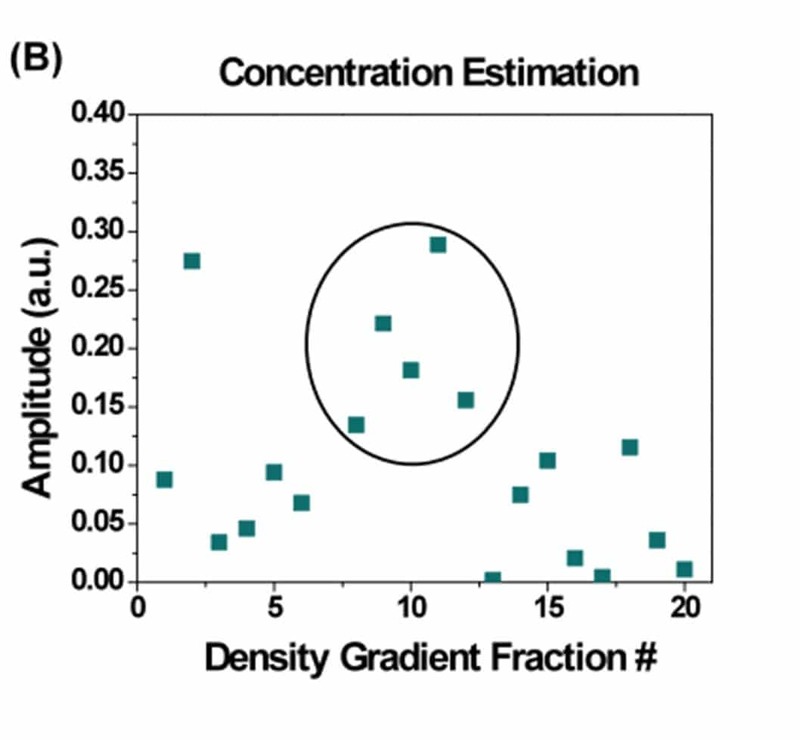 In order to truly isolate exosomes and collect only biological par ticles ranging from 30–120 nm in diameter, a density gradient fractionation is necessary (Figure 3B). Contamination from smaller macromolecules is eliminated in fractions 8–12, while it is still present at high levels in the first and later fractions (Figure 3B). Proteins have a density of ~1.20 g/mL, so protein contamination in the higher density fractions (15–20) makes intuitive sense. As expected, there appears to be a “sweet spot” for the density gradient—fractions 8–12 appear to be the point to which exosomes migrate during ultracentrifugation, based on diameter and density (Figure 4A). Concentration of biological particles also appears to be highest in this fraction range (Figure 4B), as indicated by an increase in the amplitude of the auto-correlation function. The amplitude of the auto-correlation function is a measure of the total scattered light reaching the detector; background solvents like PBS will have an amplitude of 0.01–0.05 (a.u.). Ideal sample amplitudes are between 0.15–0.95, which gives enough signal above the background noise for accurate sizing results (the size distribution comes from an exponential decay fitting to the auto-correlation function). It is important to note that amplitude is an indirect indicator of particle concentration; it is impossible to directly derive concentration from DLS measurements. Exosomes have come into focus, as more research focuses on extensive potential of exosomes in diagnostics and therapeutics, in addition to a need for a reproducible and well-rounded method to purify. Differential centrifugation combined with density gradient centrifugation provides a good combination for enrichment of exosomes from cell culture medium while minimising co-purification of protein aggregates and other membranous particles. 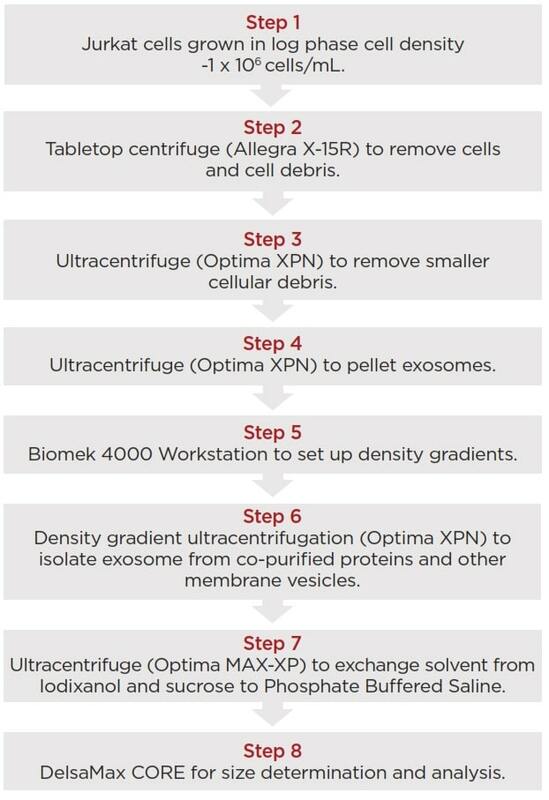 In this application note, we have demonstrated ways to handle the entire exosome preparation workflow, from initial centrifugation, to density gradient preparation and ultracentrifugation, through final analysis. The ease of use of the Optima MAX-XP Ultracentrifuge and Optima XPN Series Preparative Ultracentrifuge and Biomek 4000 Workstation helps a researcher save time while reducing errors. At the same time, accuracy and versatility of the DelsaMax CORE saves time and improves data output, which is extremely valuable to a researcher in the dynamic field of exosomes. Figure 3. e 3. DelsaMax CORE Size Distribution (A) is the size distribution of the exosomes after ultracentrifugation without any density gradient fractionation (n=2). Note that the peak of the mass is centered between 7–9 nm, indicative of high protein contamination in the exosome sample. 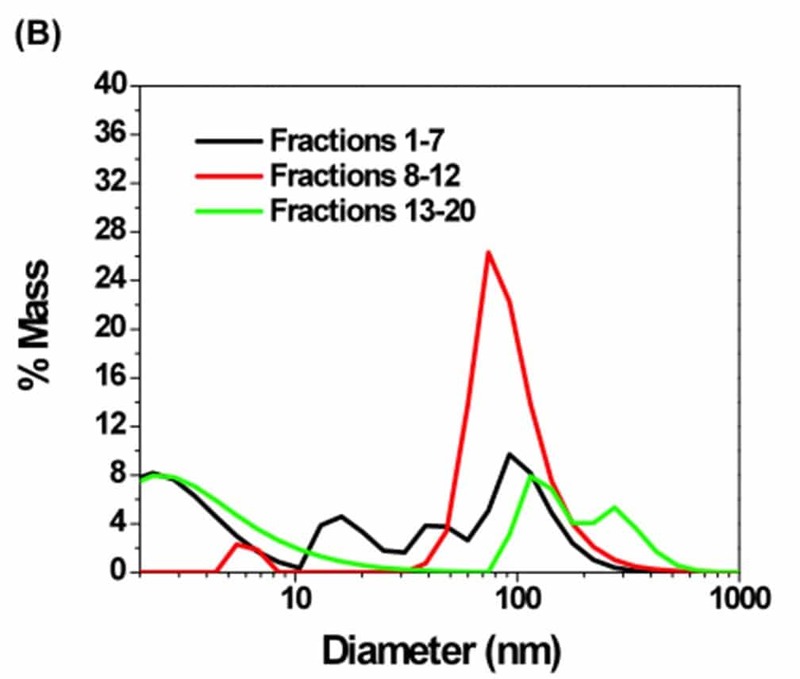 After density gradient fractionation, (B) fractions 8–12 have their peak of mass between 60–120 nm, with little evidence of protein contamination. Comparatively, Fractions 1–7 and Fractions 13–20 have high-protein contamination; fractions 13–20 also have contamination with larger biological macromolecules up to 500 nm in diameter. Figure 4. Fraction Size Distribution. (A) The peak diameter for the density gradient fractions of the exosome samples stabilized between 80–120 nm at densities between 1.13 g/mL to 1.15 g/mL (Fractions 7–12), indicate later fractions vary widely in size while earlier fractions have contamination of smaller species. 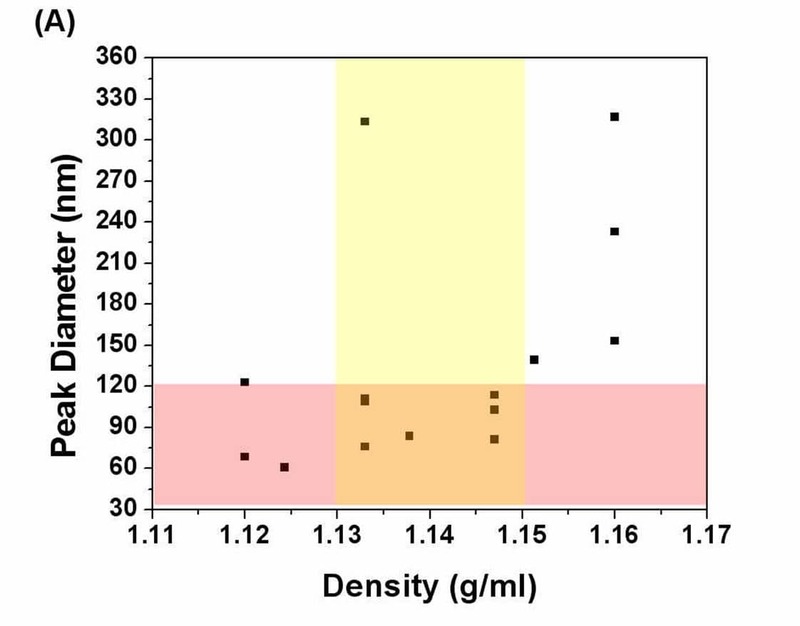 Exosomes have estimated densities at 1.13–1.15 g/mL8. Data points in the orange region are most likely exosomes based on size and density. In order to avoid interference from protein contamination in the first and last fractions, the peak diameter range is from 30 nm to 1000 nm; all particles smaller than 30 nm (such as proteins) have been ignored. (B) The concentration of exosome particles also peaked between Fractions 8–12, as estimated by the amplitude of the auto-correlation function. Amplitude below 0.10, as with most fractions before fraction 8 and after fraction 12, is barely above the noise level. The low amplitude level indicates that very few particles are present and the data will be less accurate. 1. Simpson R J and Mathivanan S. Extracellular microvesicles: the need for internationally recognised nomenclature and stringent purification criteria. J Proteomics Bioinform. 5: (2012). 2. Van Der Pol E et al. Optical and non-optical methods for detection and characterization of microparticles and exosomes. Journal of Thrombosis and Haemostasis. 8.12; 2596–2607: (2010). 3. Simons M and Raposo G. Exosomes—vesicular carriers for intercellular communication. Current opinion in cell biology. 21.4; 575–581: (2009). 4. Keller S et al. Exosomes: from biogenesis and secretion to biological function. Immunology letters. 107.2; 102-108: (2006). 5. Pegtel, Michiel D et al. Functional delivery of viral miRNAs via exosomes. Proceedings of the National Academy of Sciences. 107.14; 6328-6333: (2010). 6. Duijvesz D et al. Exosomes as biomarker treasure chests for prostate cancer. European urology. 59.5; 823-831: (2011). 7. Tauro B J et al. Comparison of ultracentrifugation, density gradient separation, and immunoaffinity capture methods for isolating human colon cancer cell line LIM1863-derived exosomes. Methods. 56.2; 293-304: (2012). 8. Zhang H. Emerging Concepts of Tumor Exosome’s Mediated Cell-Cell Communication. Springer, 2013.